At the time of writing this, I’ve just finished three full days of demoing, both for Hedron and my new game Ragnarol. I’ve also got some more copies out there and a few questions floating back to me. I’ve added some rule clarifications (the major one is Ram), and I also wanted to give players a little bit more guidance about how to approach the recommended maps. After the list below, I’ve included a little brief for each map, but if you’d prefer to discover the strategy of each maps, you can just go through this list in order. Skip all the way to the end for some guidance on how to design your very own battle galaxies. Start with the classics. These maps are just Hedron: lean , mean and with no extra fat. There’s plenty of room to play on these, allowing each player to stretch out and gather resources before fighting over the precious prestige to be found in the centre of the map. For Print and Players, these are the unlabelled pages 6-8 of the full colour PDF. If you’re enjoying the classic maps and want to play a few more times before introducing any new mechanics, you can increase the pace of the game by using the Roll With It option (found on the back page of the rule book). If you’re not comfortable giving so much control to the dice gods, simply place the d12 in Flux at the beginning of the game. This will allow players to punch a little harder right out of the star gate. 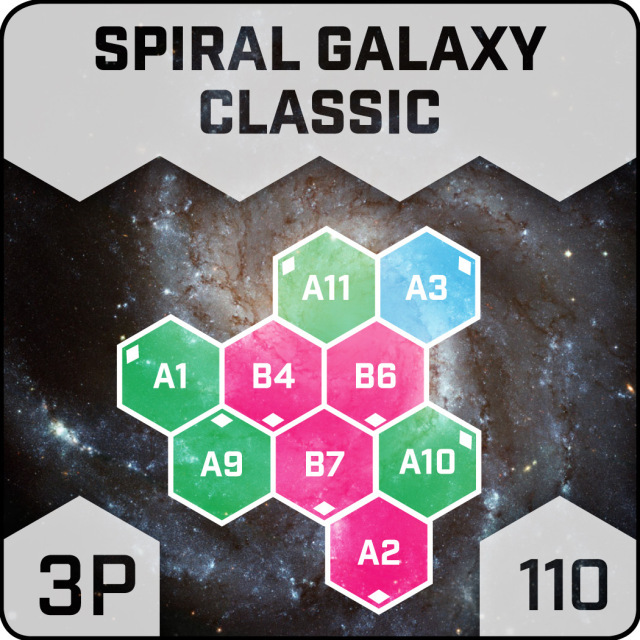 To add a little of pace to the game, introduce Current Hexes with Spiral Galaxy Classic for 3 players, or for 2 players, set up Jazz Nebula and then flip the centre tile to it’s A-side. These maps will add a little more chaos to your battles, allowing players to launch their Hedrons across the map for devastating non-Flux attacks with little energy expenditure. For Print and Players, these are just called Spiral Galaxy. Current Hexes make the Hedronverse a more dangerous place, but Shift Hexes add something that is less explosive but more dramatic to your final score. 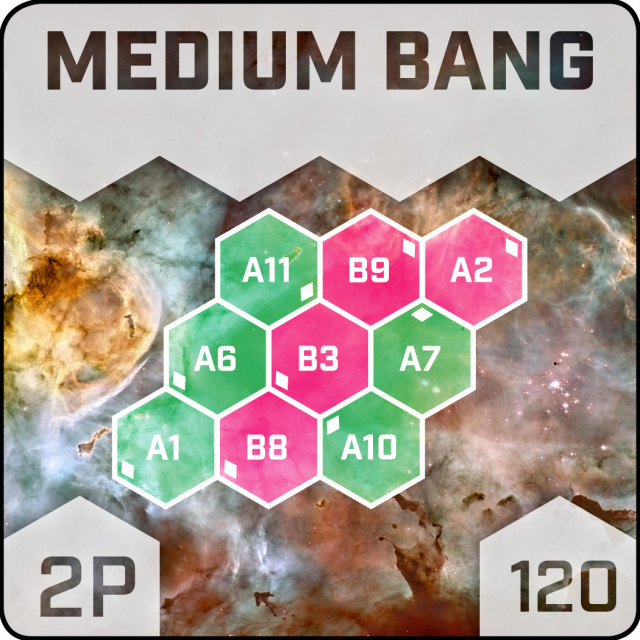 Any of the maps with BANG in the title are the best way to introduce Shift Hexes. Once you’re all set up, get slightly nervous about all those Points Hexes. More than any of the other maps, the BANG galaxies force you to make some hard choices. 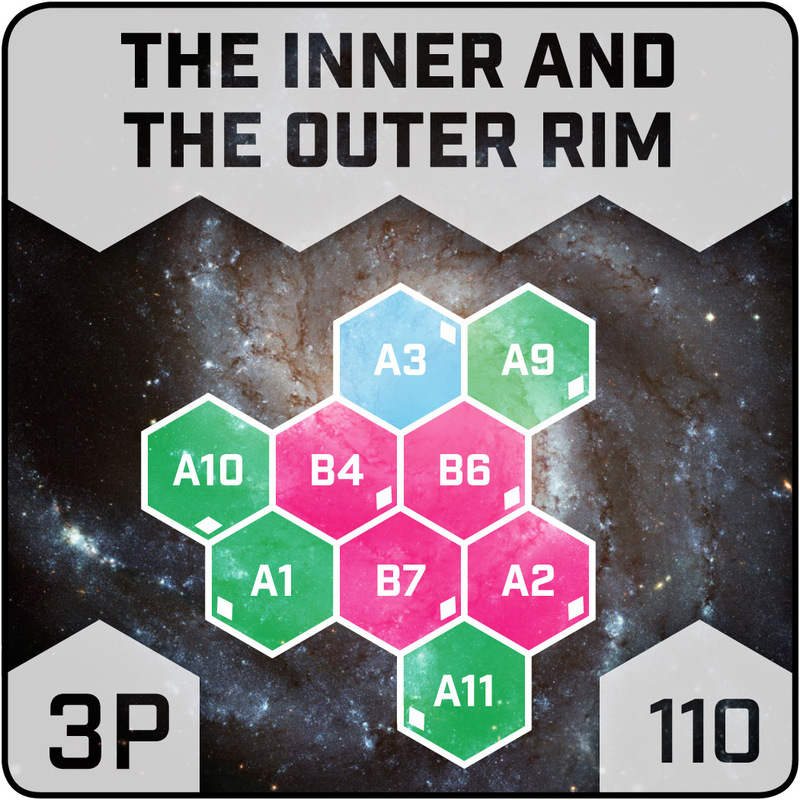 Getting on a Shift Hex early will improve your efficiency throughout the game but you can easily find yourself left behind in the race for points if you don’t devote resources to occupying Point Hexes as well. But, of course, there’s a whole other army (or two) of enemy hedrons out there, full of flux and spite, standing between you and efficiency / victory. Once your play group has fully grasped the concepts of the Hedronverse, it’s time to tear everything down and smash it all together. 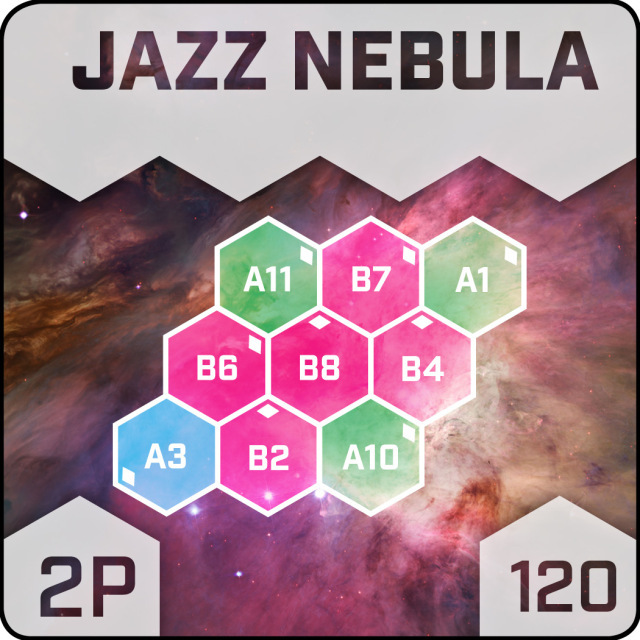 Spiral Galaxy Turbo and the Jazz Nebula combine both Shift and Current Hexes to make a game that is full of both order and chaos. Players will not only be able to reposition their forces for the perfect chain sequence, they’ll be able to add the slingshot power of Current Hexes on top, or merely jump in the current out of the chain to advance (or retreat) across the galaxy. For Print and Players, these are just called Turbo Spiral. The Inner and the Outer Rim maps uses current hexes in a unique way. In this galaxy, Current Hexes don’t increase your movement options, they limit them, as all Current Hexes lead to the edge of space and death. This makes the galaxy very taxing for aggressors. There’s also a nice little safe haven for all the players, allowing them to generate both Flux Cards and Prestige Points in relative safety, which would be fantastic, if your opponents weren’t doing the exact same thing. In this galaxy, you’ll need to take the fight to your opponents and make sure no faction is left to thrive in peace. You’ll probably find the Charge phase even more useful with the greater variety of hexes. Shift Hexes allow you to more efficiently move across space, but a hedron on a Shift Hex is neither in the fight or providing you with Flux Cards. A well-timed Charge can give you the resources you need to stay dangerous, as well as a greater freedom of movement, with Current Hexes both obstructing and enabling routes. More than anything else I’d love to see some galaxies of your own. 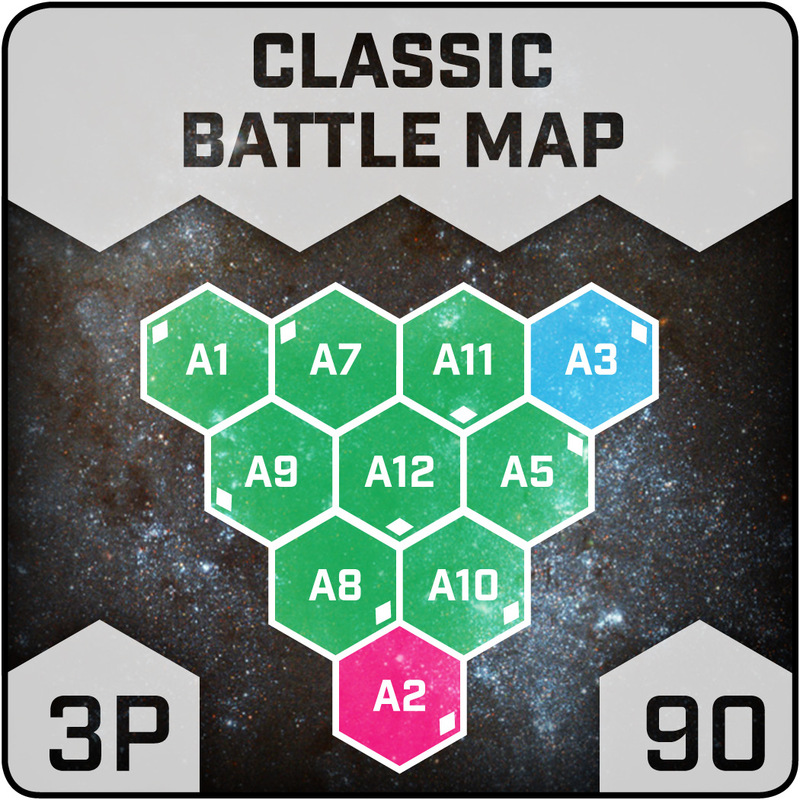 The Semi-Random Battle Map gives you options to generate a galaxy in a competitive setting, but there’s no reason, with the permission of your fellow players, that you can’t design your own with thought given to create an interesting play experience. You can easily create a “fair” map by ensuring players have equal access to resources, but with 3 players unequal access could create some ruthless space politics. We’ve had some interesting sessions using unusual configurations, including long galaxies that take multiple turns to reach the centre Points Hexes and 1-on-1 mini-galaxies of death made of only 4 tiles.